In 2013, acclaimed Chilean director Pablo Larraín’s ‘Pinochet trilogy’ reached its pinnacle when No was nominated for an Academy Award. Larraín has vowed never to make another film on Chile’s darkest days but now, for the first time, all three acclaimed films will be released as part of one set. To celebrate the release of The Pablo Larraín Collection this coming Monday (23 September), we have THREE DVD copies of the three-film box set to give away to our avid readers, courtesy of the very generous team at Network Releasing This is an exclusive competition for our Facebook and Twitter fans, so if you haven’t already, ‘Like’ us at facebook.com/CineVueUK or follow us @CineVue before answering the question below. 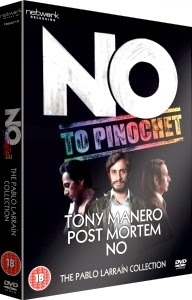 This definitive Larraín set consists of three superb films charting life in Chile at various stages of the Pinochet regime. Tony Manero (2008) follows the tale of a Saturday Night Fever-obsessed psychopath living under the regime at the height of its power. Post Mortem (2010) is set amidst the backdrop of the 1973 coup. And finally, No (2012) – starring Gael García Bernal – tells the true story of the election campaign that brought democracy to Chile. Which Chilean actor stars in all three films within Larraín’s Pinochet trilogy? The Pablo Larraín Collection is released on DVD from Monday 23 September, courtesy of Network Releasing. The competition closes at 6pm on Thursday 25 September, 2013.